The AGRETO hay and straw moisture meter HFM II is a professional measuring instrument for determining moisture level and temperature of baled hay and straw. 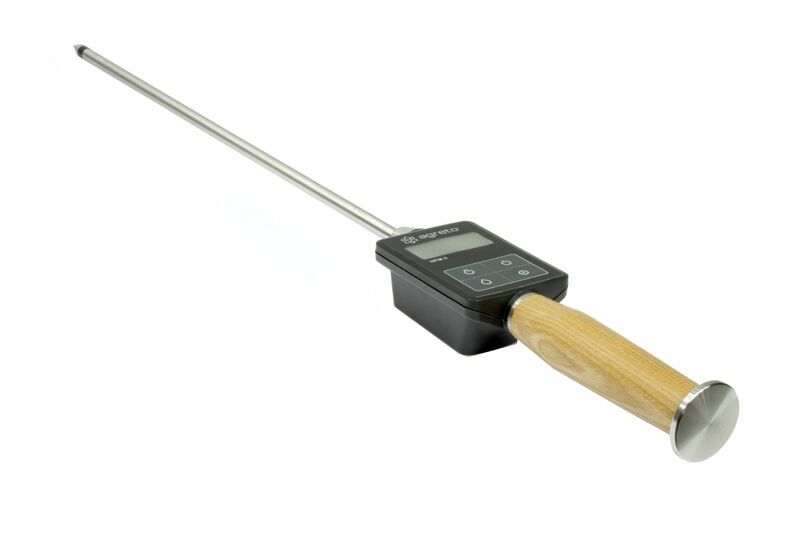 The AGRETO HFM II consists of a solid stainless steel probe and an ergonomically shaped wooden handle. This makes the instrument extremely robust and ready for many years of use. The display continuously shows the actual moisture level. In just a couple of seconds you can measure different parts of a bale, or a large amount of bales without having to press a button. With the AGRETO HFM II you can assure feed quality during harvesting or drying. This way you prevent loss due to mould and rotting. Buyers and/or sellers can check the moisture level of hay and straw bales and thus prevent possible claims. If the measured moisture exceeds the set threshold, the device will emit an audible alarm.